Southern League Premier Division: Bedford Town 7 North Greenford United 0. Bedford Town ran riot over basement side North Greenford United with a thumping 7-0 victory on Saturday. The hosts proved to be too much for United with midfielder Will Summerfield bagging a hat-trick as the Eagles made it a trio of victories. Boss Craig Adams made just one change by bringing in Summerfield to the starting line-up; a switch that proved to be decisive. The hosts started well as Summerfield fed Rob Parker, but the midfielder got the ball caught between his feet and the eventual effort went wide. In the fifth minute, Eagles took the lead with the first penalty of the day. Ross Oulton, fouled in United’s area by Joe Hopla, then picked himself up to convert the spot kick and open the floodgates for the home side. Town were 2-0 to the good after 19 minutes when visitors keeper Christian Pal could only deflect Summerfield’s free kick and Greg Ling came in to direct the ball home. Three minutes later the hosts were out of sight with a third as Summerfield was on target, and slotting past the stranded Pal. The Eagles maintained their pressure as they created a number of attempts on goal, scoring their fourth a minute before half time as Summerfield’s cross found Josh Winters, who saw his shot saved by Pal, only for the ball to rebound off Parker and into the net. Jordan Davis replaced the injured Callum Lewis at half time, and five minutes into the second period, was brought down in the North Greenford area by Luis Fernandes, giving Bedford their second penalty of the day. Oulton stepped up again, but saw Pal this time save his stinging shot. On 68 minutes, the hosts keeper Garry Malone was brought into the action, with a comfortable save from United midfielder Ibrahim Bah’s header, the only real attempt from the away side. Bedford’s fifth came in the 73rd minute as Summerfield, free of the defence tried to round Pal, but Pal’s challenge brought him down. Mr Forrester pointed to the spot for the third time in the match, and gave Pal a straight red card. Hopla took the goalkeeper’s jersey, and his first job was to pick the ball out of the back of the net after a Summerfield took the penalty. Bedford added a sixth goal a minute before full time when Summerfield crossed from the right, Luke Fairlamb’s shot was blocked and Cooper came racing in to slot home the rebound. 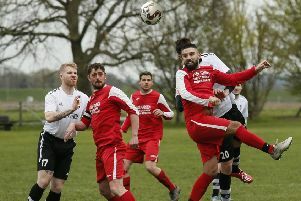 There was time for one more goal and a hat-trick for Summerfield in the third minute of stoppage time, as he eased away from a tired defence to complete the rout. Bedford host Bedworth on Tuesday evening. Eagles: Garry Malone, Paul Cooper, Joe Hopewell, Callum Lewis (Jordan Davis 46), Jeff Woodward, Ollie Wilkinson (C), Josh Winters (Curtis Shaw 61), Ross Oulton, Will Summerfield, Rob Parker, Greg Ling (Luke Fairlamb 69). Subs not used: Josh McGoldrick, Kerran Birch. North Greenford Utd: Christian Pal, Jay Jay Simon (Cameron Crisp 69), Luis Fernandes, Jessy Yoboue [C], Joe Hopla, Ahmed Mohammed, Vitor Monteiro (Paulo Sousa 24), Tyrelle McLeod-Bentley, Ibrahim Bah, Ivan Ruiz, Gerard Flanagan (David Florescu 73). Assistants: Mr Trinder & Mr Stevens.